VICTORIA Beckham asked Lady Gaga for her autograph when she met her on Sunday (08.12.13). The fashion designer spoke to the 'Do What U Want' hitmaker backstage at Capital FM's Jingle Bell Ball concert at The O2 in London and she was so excited to meet the pop superstar she got a memento of the meet-up. Victoria also praised Gaga for being really friendly to her children - sons Brooklyn, 14, Romeo, 12, Cruz, nine, and two year old daughter Harper. She wrote on Twitter: "Met @ladygaga last night, so sweet to the boys and Harper. What a show, she is AMAZING! !x vb. 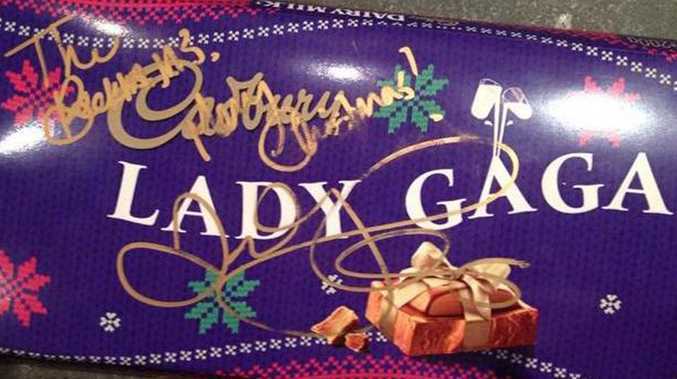 (sic)"
Victoria, 39, also uploaded a photograph with her tweet which showed a personalised Lady Gaga Cadbury's chocolate bar which the star had signed and added the message "The Beckhams, Merry Christmas!" The Beckhams then watched the concert which had a line-up featuring Jessie J, Little Mix, Jason Derulo, Dizzee Rascal and headlined by Gaga. Former Spice Girl Victoria has long been an admirer of Gaga, 27, and recently praised her eye-catching style choices. She said: "I think she is obviously incredibly, very, very talented. "She writes all of her songs, she can really sing. She is a phenomenon. I have a lot of respect that she can walk in those shoes going through airports. "I mean, goodness, people think I dress up to go to an airport! I think she's really doing her thing. That's her."